Using the urban housing policy as a case study, this research forms part of an attempt to evaluate policy making and implementation in the first 20 years of independence. 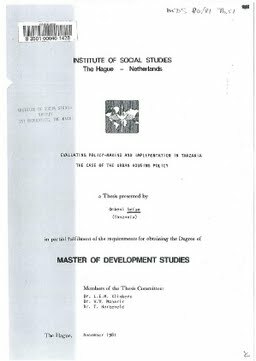 In addition the research is intended to provide a new approach and a new framework for policy evaluation in Tanzania. The new approach should be more behavioural than normative, practical rather than theoretical. The lack of realistic and adequate criteria in existing models for evaluating policies in developing countries dictates that policy evaluators must look elsewhere for meaningful evaluations. Emphasis must be on the socio- political contexts rather than on existing normative and prescriptive models developed in developed countries. Thesis Advisor Klinkers, L. E.M.